To see more products in this category, please click on the Toy Product Search link in the upper right hand corner and click on 'Advanced Search' to search by category. More products will be added weekly. WudWorkers™ Air Racer by MAXIM ENTERPRISE INC.
HEXBUG® Nano Hive Habitat Set by INNOVATION FIRST LABS, INC. 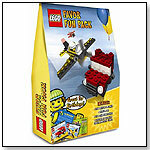 This 22 piece rattling building block set was designed specially for Little Builders. 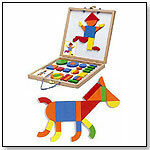 Shake, rattle, and build with these colorful blocks sized for little hands. Launch date: June 2011. Dado Bricks by FAT BRAIN TOY CO.
Tobbles by FAT BRAIN TOY CO.
"While there are several stacking toys on the market, none of them are circular and included the added element of balance. Tobbles is a stacking toy which encourages children to explore and discover," Erik Quam, Director of Product Development at Fat Brain Toy, told TDmonthly. 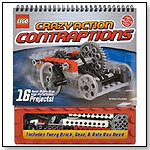 LEGO Crazy Action Contraptions is a brand-new book of brand-new, high-performance projects. From the supercharged Speedster to the Squeezeclaw Grabber to the Wall Rocket Racer — all these contraptions spin, stretch, speed, or otherwise spring into action. And all of them are totally buildable thanks to super-clear instructions and step-by-step diagrams. Every single one of the 16 projects can be constructed using just the custom selection of LEGO® bricks that come with the book. — As of 05/12/2011 this product had 4.7 out of 5 stars from 15 reviews on Amazon.com. Cons: Some contraptions run slowly; the included rubber bands wear out with time. 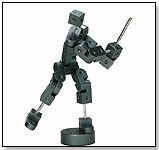 — "Klutz Lego contraptions is by far our biggest seller," Mary Porter Green, owner of The Curiosity Zone in Asburn, Va., told TDmonthly in late Spring 2011.